The renovation, restoration and maintenance of the house is expected to cost approximately $6 million and is being funded through donations to the Electrical Workers Historical Society, a nonprofit that has filed for tax exempt status. Beginning at the $100 giving level, donors may receive gifts, many of which are customizable and will decorate Founders’ Park. Gifts include bricks, paver stones, commemorative plaques and benches, and even museum wings. All donors will receive a certificate of acknowledgement watermarked with an image of the Miller home. NOTE: The IRS has determined that the Electrical Workers Historical Society is a 501(c)(3) tax-exempt organization. The effective date of the exemption is October 2, 2015. Donors can deduct contributions to the Society made after that date. Consult your tax professional with any questions regarding your donation. Click on the links below for donation examples! A certificate of appreciation watermarked with an architectural sketch of the National Brotherhood of Electrical Workers of America – Henry Miller Boarding House museum. 100% Union-made in teh U.S.A T-Shirt with an image of our Founding Fathers! Shirts are available in all sizes up to 4x and in the following colors (click for image): Khaki, Navy, Line Green, Slate-Blue, and Charcoal. The Electrical Workers Historical Society is casting commemorative coins with an image of the boarding house on one side and the original, hand-drawn, National Brotherhood of Electrical Workers of America emblem on the other! Have a brick personalized to commemorate your family or your local union. The bricks will be located in Founder’s Park. Stone pavers will be placed throughout the courtyard. These stone pavers will stand out, as will your message, which will be displayed proudly. Pavers and Bricks installed already placed in Founders Park! Antique street lights manufactured by our Brothers and Sisters from IBEW Local Union 1710 in El Monte, Califorinia will illuminate Founders Park and will feature a prominent dedication plaque commemorating the donor. $10,000 Donation - Brick and Stone Column with Medallion - see this chart for availability (Please note: chart may not be 100% accurate). NOTE: The Society has opened up the back of the columns. 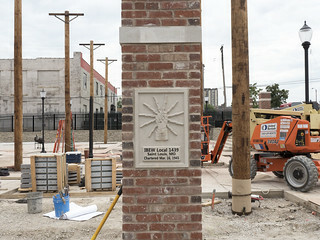 Column medallions are now available facing into Founders Park. The fence around the property will be a prime spot to show off your local’s dedication and support for the history of the IBEW. Brick and stone columns will display your Local Union on a carved stone medallion. Here is a short video of one of the columns! Your local union may sponsor the NBEW’s first hand-drawn emblem or the familiar contemporary IBEW logo. Visitors to the park will transition under a decorative iron framework adorned with your Local Union dedication - To see the full frontal elevation - see this drawing (opens in a new page)! There will be 10 resin lineman statues atop poles, representing each of the founding fathers bordering Founder’s Courtyard. Each pole will be identified with a founding father’s name and the local union that sponsored it. At the center of Founders Park will be a natural gas torch, illuminated for special events - IBEW Forever! Bridging the entryway to our new museum will be a large iron archway adorned with our insignia and a dedication plaque featuring your Local Union (IBEW Local 702 Dedication Plaque)!! JT Kelly's printing office: In 1893 JT Kelly would first published THE ELECTRICAL WORKER Journal at #14 Emilie in Downtown St. Louis. Adjacent to our Founding Fathers bedroom the Society plans to recreate JT Kelly's first publishing office. We offer our sincerest gratitude for your donation in any amount. Your support has repeatedly played a key role in the success and long term survival of the IBEW.